Whitney Jennings brings the ball down the court during Butler’s 70-52 win over Kent State on March 23 in the second round of the WNIT. Jennings scored a team-high 23 points in the game. Photo by Jimmy Lafakis. 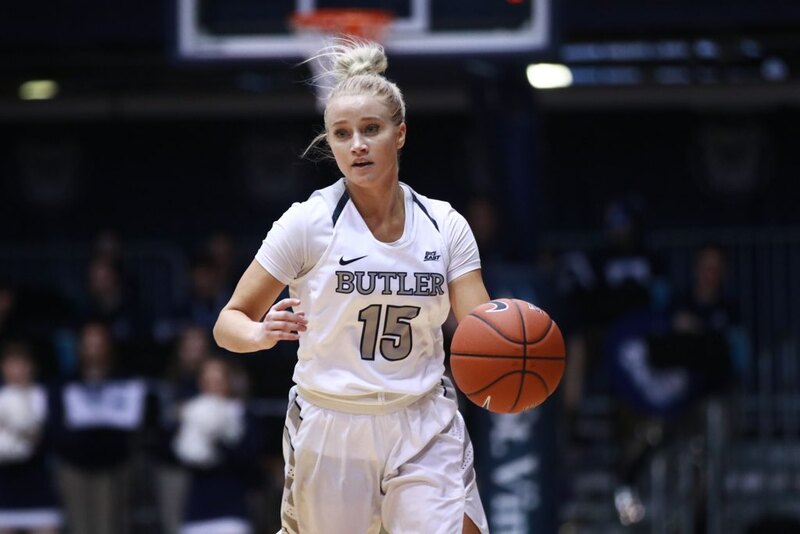 The Butler women’s basketball team defeated Kent State 70-52 at home on March 23 in the second round of the WNIT tournament, thanks to a run spanning the second and third quarter. For the second consecutive game, Butler’s offense started slow. After the first quarter, Kent State led 6-5. Kent State broke through the gates of the second quarter, quickly building an 8-5 run. They would score just two points over the next 11 minutes, while Butler sped on a blistering 30-2 run. That extensive run was sparked by a 7-0 run in a span of only 34 seconds, with Whitney Jennings scoring all seven points. It pushed Butler’s lead from 19-14 to 24-14. Kristen Spolyar and Naira Caceres combined for a pair of threes in 30 seconds to end the first half. While Kent State and Butler mirrored each other with 18 turnovers in the game, Butler was able to capitalize, scoring 20 points off turnovers. Despite recording four fouls with two minutes to go in the third quarter, Michelle Weaver had three steals in the game. Tori Schickel added three steals, and Caceres had two. Kent State’s first field goal since 7:00 minutes were left in the first half came with 7:42 to go in the third quarter. It was a layup by Merissa Barber-Smith. Spolyar answered with a corner 3-pointer, and Butler led 54-35 by the end of the third frame. Jennings, Spolyar, and Schickel accounted for 81 percent of Butler’s points. Jennings led the team with 23 points on 9-of-17 shooting. Spolyar scored 22 points on 9-of-15 shooting. Both scored more than 20 points for the second consecutive game. Schickel had 12 points, making eight trips to the charity stripe for the second consecutive game. “I think when we play together, play loose, have a lot of fun while sharing the ball, all of us do really well, and I benefit from that style of play,” Spolyar said. Butler’s next opponent in the WNIT will be decided on March 24, when Minnesota and Cincinnati face each other in the second round. Butler will play the winner of that game in the third round some time between March 27 and 29.